For immediate notification of special offers and new products 'Like' us on Facebook. Pinterest is a virtual Pinboard. It lets you organize and share all the beautiful things you find on the web. On our Pinterest boards you will find hundreds of layout and scrapbooking ideas. Follow us and join in the fun. Join us on Twitter to keep up with all the latest news. 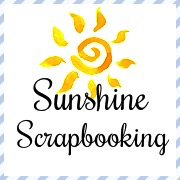 Fabulous organised Scrapbooking weekends away. If you would like to have your link or logo here, please contact us and provide a reciprocal link.